Charge 2 devices at the same time while using receptacles as well. Total charging capacity of 2.5A. 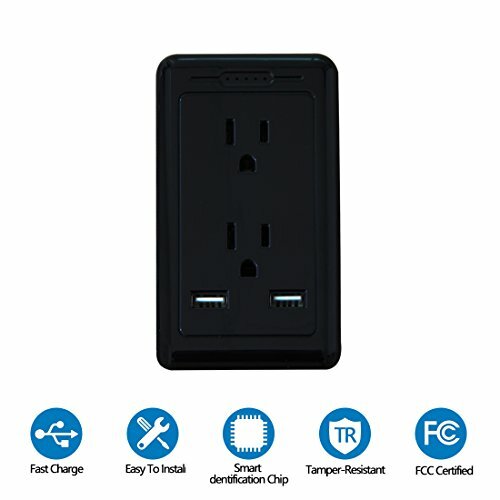 Built-in surge protector and tamper-resistant receptacles. Back and side wire terminals accommodate #14 AWG - #12 AWG. Standard and solid copper wire for installation flexibility. Application: Living room, office, bedroom, school and other public areas. Step 1: Follow the STRIP GAUGE to strip the thermoplastic insulation Layer (copper part). Notice: This outlet only use #12 - #14 wire. Please notice the STRIP GAUGE on the back of the outlet. Step 2: Push the screw and insert the wire through the back-wire hole on the top. Step 3: Tighten the screw CLOCKWISE. Notice: DO NOT TIGHTEN IT ANTICLOCKWISE! If tighten it in a wrong way once a time, the screw won't be tightened anyway.